Navajo Nation Council Delegate Leonard Tsosie’s “Emergency” Legislation 0341-14, which would nullify the 2014 August Primary Election for the Presidential race only and approve a new Primary Election for Presidential candidates, followed by a Special General Election for President is on tomorrow’s, Dec. 30, 2014, special Council agenda. In legislation related to 0341-14, Tsosie got the Council to Table Legislation 0249-14, which was for the appropriation of $286,247 in funding for the Navajo Election Administration to immediately conduct a Special Presidential Election between Former Navajo Nation President Joe Shirle Jr. and Navajo Council Delegate Russell Begaye, during the Council’s special session on Dec. 23, 2015. But before the Council Tabled Legislation 0247-14, Tsosie successfully got the Council to amend 0247-14 by adding language that removed the language “immediate” and replaced it with language that allowed the Navajo Election Administration to hold the Special Presidential Election anytime before Aug. 31, 2015. Another piece of legislation related to 0341-14 that Tsosie got the Council to amend and approve was Legislation 0289-14, which removed the Navajo language fluency requirement for presidential candidates and all elected officials and made the effective date retroactive to when the 17 individuals filed to be presidential candidates for the 2014 Primary Election in August. The Amendments to 0289-14 removed the Retroactive Effective Date and replaced the wording for the Removal of the Navajo language fluency requirement for all elected officials with new wording that basically removed the Navajo language fluency requirement because now it’s the Navajo voters that decide with their vote if a presidential candidate is fluent in the Navajo language. Tsosie sponsored both Amendments. But today, Dec. 29, 2014, Tsosie was not so successfully before the Council’s Naabik’iyati Committee, which recommends legislation to the Council. The Council is having another special session tomorrow, Dec. 30, 2014, and released their proposed agenda, which can be amended by the Council when its adopting it or anytime during the special session. Tsosie was sponsoring Legislation 0391-140391-14, which was a Pardon for the Navajo Election Board. On Oct. 31, 2014, the Navajo Nation Supreme Court found the Navajo Election Board in CONTEMPT of its Oct. 23, 2014, Writ of Mandamus court, a misdemeanor, on Oct. 31, 2014, for failing to enforce the Navajo Nation Office of Hearings and Appeals Final Ruling on Oct. 9, 2014, which disqualified Chris Clark/Deschene as a presidential candidate. The disqualification immediately triggered election law that mandated that the next presidential candidate, who was Navajo Council Delegate Russell Begaye, be moved up into the position vacated by Deschene, which was the number two position in the 2014 General Election presidential race. Legislation 0391-14 was the last item on the Naabik’iyati Committee’s agenda today and after legislative staff read 0391-14 into the legislative record, Naabi Committee Chairperson Pro Tem LoRenzo Bates announced that Naabi had lost a quorum at about 4:58 p.m. The lack of a quorum prevented a vote on 0391-14. Before Bates convened Naabi today, Dec. 29, 2014, which was about 1:57 p.m., I had the opportunity to video tape an interview with Tsosie about his legislation and amendments that were all related to the Special Presidential Election. Tsosie repeatedly denied that his legislation and amendments were to put Deschene back on the ballot. Legislative staff reported today that amended Legislation 0341-14 was sent to Navajo President Ben Shelly today for his signature or veto. Navajo law allows the president ten days to make a decision. 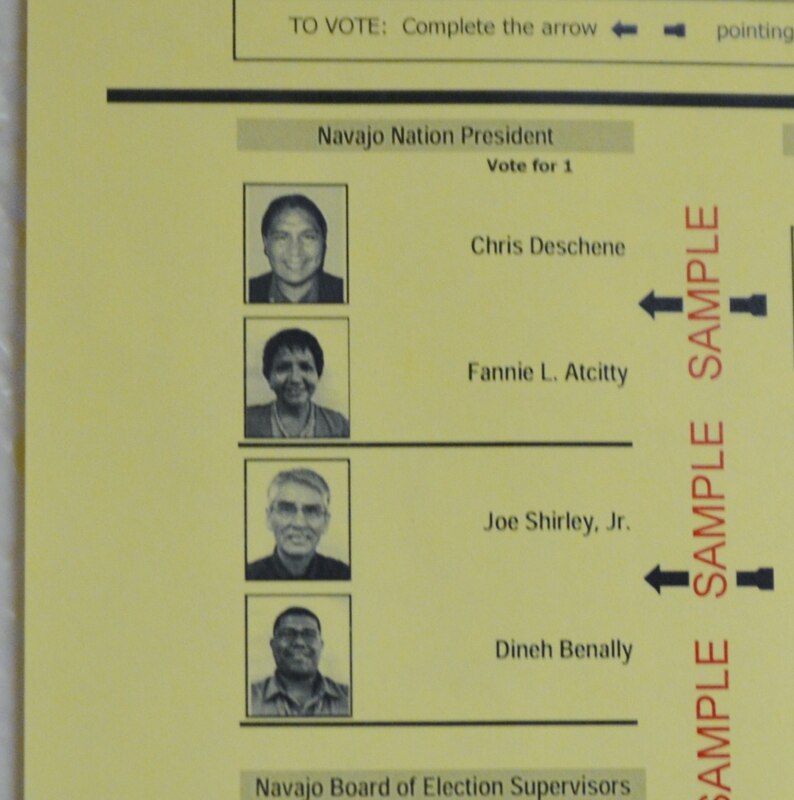 This entry was posted in Professional Journal and tagged 2014 primary election, Chris Deschene, elections, Joe Shirley Jr, Navajo, Navajo Election Administration, Navajo Election Board, Navajo Nation Council, Navajo Office of Hearings and Appeals, Navajo Supreme Court, Russell Begaye by Marley Shebala. Bookmark the permalink.